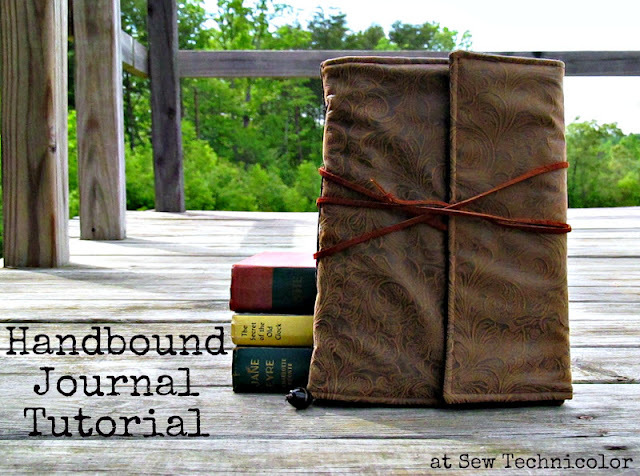 This is part two of a three part tutorial about how to make your own handbound journal. To see the previous part, click here. Or click here for part 3. 1. 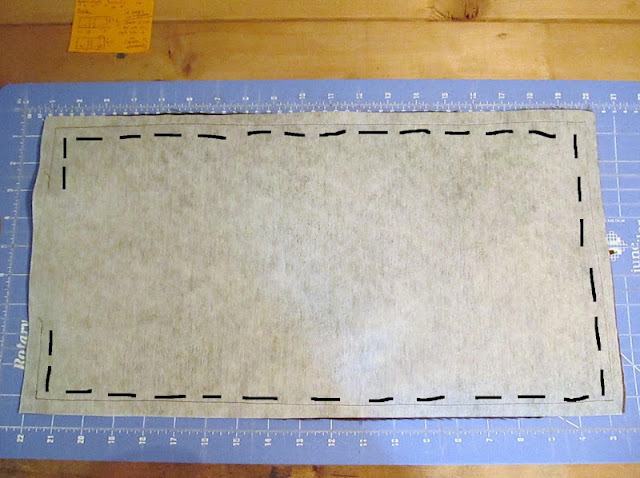 Cut your outer fabric into a rectangle measuring 10.25 x 19.5 inches. 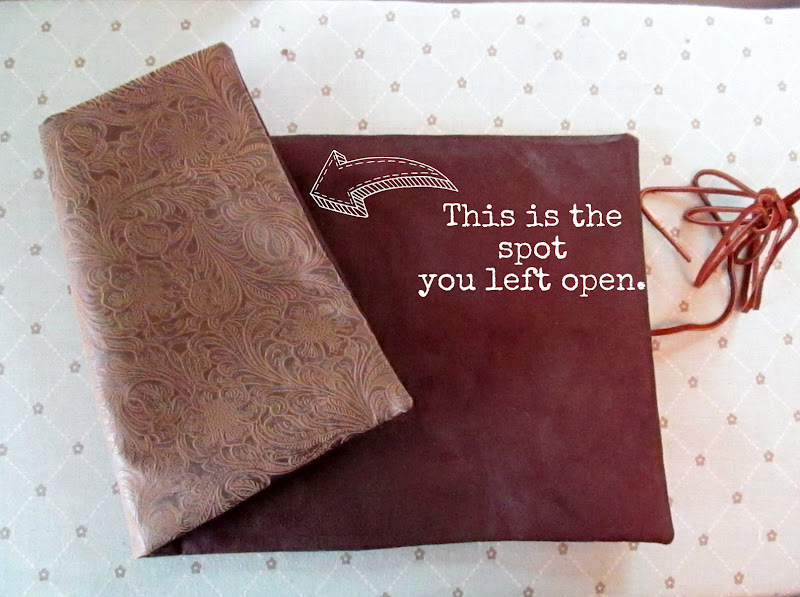 Repeat with the fabric you want to use for the inside of the journal (I used fake suede). 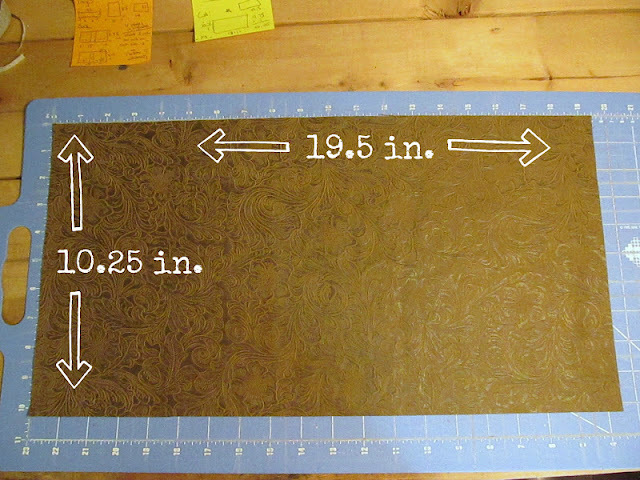 Go ahead and cut out your interfacing or batting into this size, too, if you're using any. In my original journal, I used one layer of fusible interfacing (Pellon Craftfuse), and I think I fused it to the inside piece (though I'm not completely sure). That gave some structure to the fake leather and made it feel more realistic and sturdy. On the book I made in this tutorial, I used a layer of batting basted to the outside fabric, as well as the fusible interfacing on the inside piece. I don't recommend doing this- it made the journal a little too poofy and wrinkly. So I say stick with one piece of fusible applied to the inside fabric. Also, if you want to add a little patch pocket or anything to the inside of the journal, go ahead and sew that on the inside piece now. 2. Cut a piece of the leather cording that measures about 50" long. Find the halfway point on one of the 10.25" ends of your outer fabric, which is approx. 5 1/8 ". Using your sewing machine, baste one end of the cord there, as shown below. Bundle the rest of the cord up so it doesn't get in your way later. 3. Place the pieces right side together. Don't pin them, because that doesn't work so well with these fabrics. The fake suede will cling to the other fabric and keep things from sliding around. Using a 1/2 inch seam allowance, stitch around the rectangle. On the short end opposite the one where you basted the cord, leave a 4-5 inch hole to turn the piece inside out through. 5. Top stitch around the cover, closing up the hole you left. Stitch about 1/4 inch from the edge. You'll probably have to sew fake suede side up, or else it will stick to your machine and make things very complicated. You'll have something like this. But hopefully less wrinkly. That's what happens when you use the batting with fake leather. 6. Get your stack of pages and place them inside the cover, with the folded edges of the pages being approx. 8 to 8 1/4 inches from the edge of the cover without the cord. Place your template guide against the folded edges of the pages, as shown. Close the cover to make sure it just covers the pages. 7. Lay the template flat down, against the folded edges of the pages. The edge of the template should be about 6.5 inches from the edge of the cover. Center it so that there is about 1/4 inch of the cover at the top and bottom of the template. 8. Punch holes with your hole punch or awl, according to the template. Keep the template straight by setting something heavy on the part that you're not working on.